Petting fluffy animals is the latest stress-relief fad. Does it work? Every so often during exam season, there’s a new animal petting event at UBC that students can attend to interact with the animals and de-stress. There’s Pet-A-Pup, Smooch-a-Pooch, Puppy Playdates, Doggy Destress, Bunny Yoga and Bunny Socials. But how much do these events actually help our mental health? Although petting ‘therapy’ animals are a fun way to wind-down for exams, these events only offer short-term relief and shouldn’t be misconstrued for actual therapy, according to experts. 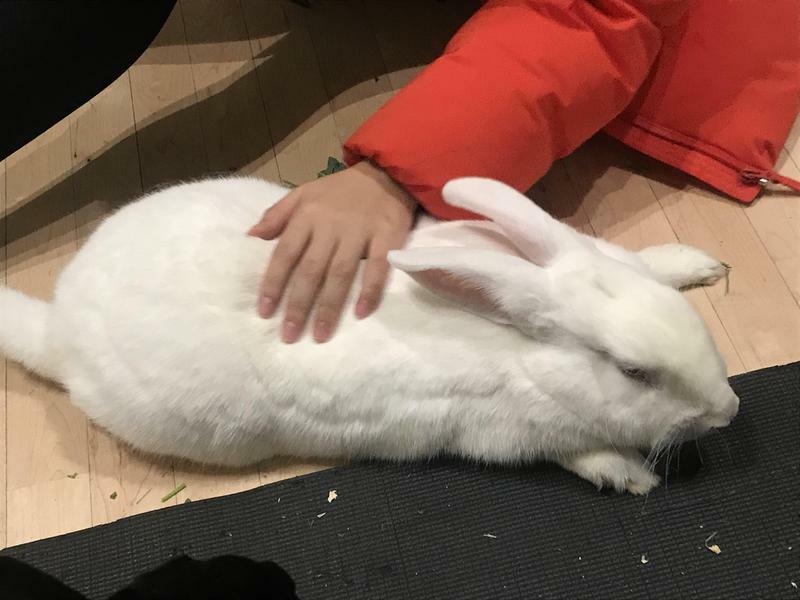 On March 18, UBC’s Pre-Vet and Animal Welfare Club (PAW) hosted a ‘Bunny Social’ in the Nest where students could pay a small fee to pet rabbits. The minimum $2 fee went to Rabbitats — a non-profit rabbit rescue that provided the rabbits for the event. Aly Pardo, UBC PAW’s social coordinator, says the recent event was “more to get the word out there for these types of organizations and for people to experience interacting with animals” than it was a response to campus mental health. Despite this, she says many students who came to the event were there to de-stress. And science suggests petting a fuzzy animal can actually have marked beneficial effects for your mental health — at least in the short-term. “About a minute’s worth of interaction with a dog begins to produce the same kinds of biochemical effects as six weeks on Prozac,” said Dr. Stanley Coren, professor emeritus in UBC’s department of psychology. Coren, who has done a lot of research on therapy dogs and how they can reduce exam stress in students, says spending time with a cuddly animal can legitimately improve someone’s stress and anxiety levels. And unlike mental health services, there’s a noticeable lack of stigma in attending animal petting events. “If you say to your friend that I’m getting a little bit wound up and they’ve got this therapy dog session over there down at the Sub, that’s not a big deal,” said Coren. But Coren added that while animal petting events are a good way to de-stress, they shouldn’t be used as an alternative for actual therapy. Some students who attend these events are aware about the effects. “I don’t think it has a really long-term lasting effect, but it is really nice short-term, like when you get a hug and you’re just bursting with warmth for a few minutes,” said fourth-year arts student Nargiza Alimova, who attended the Bunny Social. “I would like to see more institutional changes to help certain problems like this, but I wouldn’t say no to more of these events,” Alimova added.